Os grid reference: SO 1287 2689. About 37 metres from the northern shoreline of Llangorse Lake (Llyn Safaddan), Powys, also known as “Savaddan Lake and Lake of Brycheiniog” (Bord, Janet & Colin, 1986), lies the tiny man-made island of Ynys Bwlc, which is in fact a crannog, a Dark Age island settlement, dating probably from about the beginning of the 10th century, or maybe earlier, which would have once supported a royal residence for the king of Brycheiniog. The lake is said to be the second largest natural lake in Wales, being formed at the last Ice-Age many thousands of years ago; the River Llynfi (Afon Llyfni) enters at the far south-eastern side of the lake and then, rather strangely flows out of the lake at the far northwestern side, close by the caravan park. The lake is 1 mile long and 5 miles in circumference. 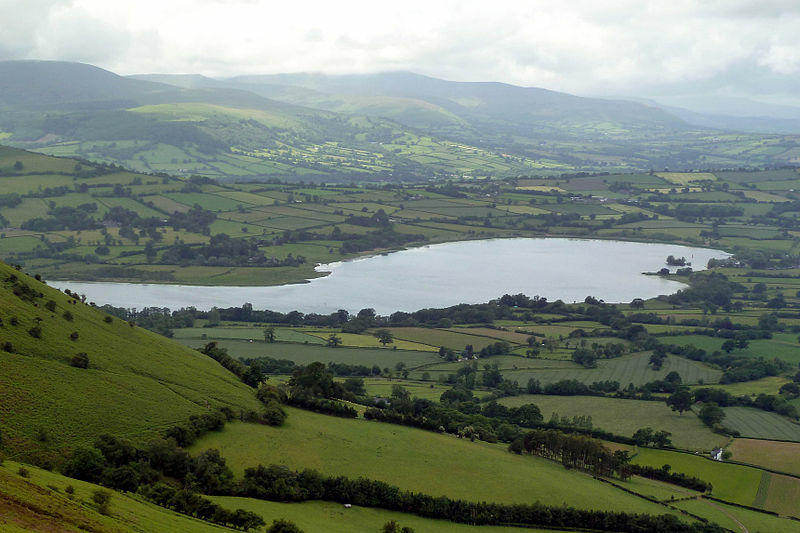 Llangorse lake and crannog can be reached on a country lane to the west of Llangorse village, heading south close to the caravan park, which brings you out at ‘The Welsh Crannog Centre’. A few miles to the south is the village of Llansantffraed while the town of Brecon lies some 4 miles to the west and, at the south-side of the lake stands the ancient church of St Gastyn at Llangasty Tal-y-Llyn. The place-name Llangorse is nowadays ‘often’ shortened to Llangors. And the lake is also the setting for a number of myths and legends – including one that says the lake is the location for the submerged Roman city of Loventium, but in early medieval history it was known as ‘Brecenenmere’. In 1925 a 25 foot-long wooden dug-out canoe was excavated from the mud near the northern shore of the lake, and in 1990 a second dug-out boat was excavated from close by. These have been dated from between the 8th and 11th centuries AD. In the 12th century Gerald of Wales (Giraldus Cambrensis) visited the lake and made mention in his great work ‘The Journey Through Wales/The Description Of Wales’ of the abundance of fish and also how miraculous it was and, the numerous strange colours that the lake water takes on at certain times. And the lake has long been associated with fairies, very large eels, and a witch who lived beside the lake and was known to frighten-away naughty children! Giraldus, who was a medieval historian, claimed that birds living around the lake would only sing ‘when a rightful prince returns to rule the area’. At this time the area was ruled over by King Henry I of England. One day the king was walking along the lake’s shoreline in the presence of two Norman lords and the Welsh prince Gruffydd ap Rhys, but he noticed that all the birds were silent. He then commanded them to sing – they ignored him, but when Prince Rhys asked them to sing – they sang merrily! Near the southern shores of Llangorse lake, near Bwlc, can be found the crumbling remains of Blaenllyfni Castle, a 12th century Norman foundation. “The tiny man-made island was first identified as a crannog in 1876 by E.N. Dumbleton”, according to Chris Barber in his work ‘More Mysterious Wales’. 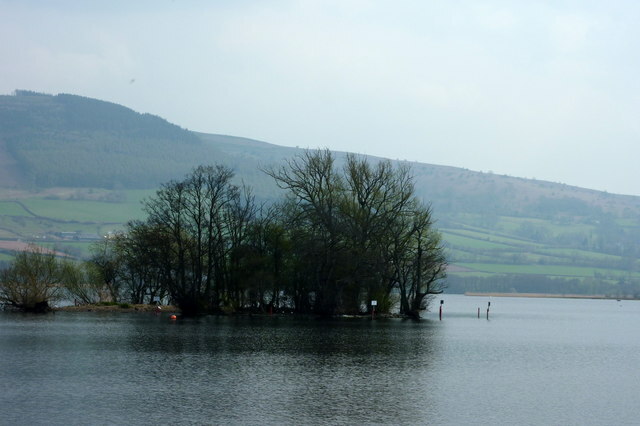 The almost round-shaped tree-covered crannog at the northern side of Llangorse Lake is thought to date from c890 AD. It was probably destroyed in either 911 AD or 916 AD possibly by King Alfred’s daughter Ethelflaed (Lady of the Mercians), when according to legend, they “took the king’s wife and thirty-three others prisoner” (Hughes, Wendy, 1995). However, some historians and archaeologists believe it could, in fact, be of an earlier date, maybe 7th-9th century? There is, however, some reason to suspect an Iron Age ‘crannog’ here, artificially improved with stakes as a lake-dwelling like those at Glastonbury and Meare in Somerset (Houlder, Christopher, 1978). According to legend a palace is said to lie beneath the waves. Long ago a ruthless princess ruled at the palace; she married a poor man from the town, but the agreement was that ‘he would bring her lots of gold’. In sheer desperation the man robbed and killed a rich merchant. When he returned to the palace with his spoils the princess immediately married him, but then shortly afterwards the murdered man’s ghost began haunting the place and, later warned the newly-married couple that their crime would be avenged, and this would fall heavily on the ninth generation of their descendants. However the princess and her husband became even more greedy and wicked – their lust for wealth being unceasing. The warning eventually came true and the palace was inundated by a deluge of water from the nearby hills which had been triggered by an earthquake – drowning both palace and town – the ninth generation of the family including the princess and her husband were killed, according to “the” legend. Local people claim to have seen the foundations of submerged buildings when the water-level is low in drought conditions and, they also claim to have heard the eerie sounds of church bells ringing out from below the waves in very stormy conditions when there is a heavy swell on the water. At the north-side of the crannog there is a sort of stone jetty which indicates where a wooden causeway once existed – linking the island to the shoreline. The artificial island measures ‘roughly’ 50m x 55m and is “set upon a base of stones and brushwood” (Figgis, N. P., 1995), and built of willow branches and reeds – with sturdy wooden piles sunk up to 7 metres down into the lake bed. It would ‘probably’ have been defended with a double row of wooden palisades. “Fragments of pottery, implements and animal bones” (Hughes, Wendy, 1995) have been found beneath the crannog during recent archaeological excavations, including the one by Time Team in 1993, and earlier in 1991 a few fragmentary metal parts from a small portable house-shaped reliquary/shrine were found during underwater excavations at the crannog; and there are also apparently traces of hut circles on the island. Dead Men’s Boats by N.P. Figgis (Atelier Productions), 1995. In 1925 a 25 foot-long wooden dug-out canoe was excavated from the mud at the northern edge of the lake at (OS grid ref: roughly SO 132 269) which ‘was’ considered to be of a early medieval date, maybe 8th-11th centuries, and so a bit more recent than the lake crannog? The dug-out canoe can be seen on display in the Brecon Museum and a replica is at The Welsh Crannog Centre on the lake’s north-western shoreline, close by the crannog. And then in 1990 second similar dug-out boat was excavated from the lake near where the first had been found. But these dug-out boats have their origins in the Iron-Age. The canoe was eventually radio carbon dated to centre on 814 AD, so there is a strong possibility that the sample dates from somewhere between the years AD 754 and 874 AD, according to author N.P. Figgis. The dug-out canoe was excavated 1 metre down in the mud by a local man Mr Thomas Jenkins, and his sons. Author N.P. Figgis in his book ‘Dead Men’s Boats’ says: “The boat they brought ashore was a long, thin dug-out canoe. Her prow had broken off, and one side had caved in, and the stern was a step-shaped, heavy block; she was not like any modern craft”. Christopher Houlder in his excellent archaeological guide book: ‘Wales: An Archaeological Guide’, with regard to the dug-out canoe says that: “Though of primitive type it may be only medieval in date, used for access to the island near the N. shore for fishing and similar purposes”. At the south-side of Llangorse Lake is the hamlet of Llangasty Tal-y-Llyn (OS grid ref: SO 1331 2613) and a mid-19th century church (on the site of an earlier medieval foundation) dedicated to St Gastyn. The churchyard looks to be almost circular in shape, indicative of a sacred site. St Gastyn was a Celtic hermit who founded the first “llan” here in the mid-5th century AD and was apparently the tutor to some of the many children of the saintly King Brychan, who ruled ‘this’ area, which became known as Brecknock (Brycheiniog). http://www.geograph.org.uk/photo/1823433 © Copyright pam fray and licensed for reuse under this Creative Commons Licence. Bord, Janet & Colin., Sacred Waters, Paladin, London W1X, 1986. Dumbleton, E.N., On a Crannog, or Stockaded Island, in Llangorse Lake, near Brecon, Archaeologia Cambrensis, 4th series, vol 1, part 3, 1870. 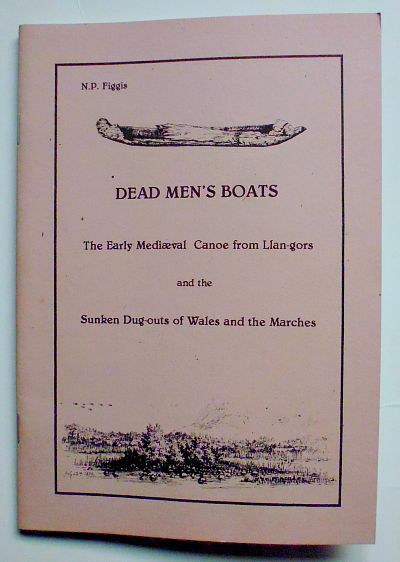 Figgis, N. P., Dead Men’s Boats, Atelier Productions, Machynlleth, Wales, 1995. Gerald of Wales., The Journey Through Wales/The Description Of Wales, Penguin Books Ltd., London WC2R, 1978. Houlder, Christopher., Wales: An Archaeological Guide, Faber and Faber Limited, London WC1, 1978. Hughes, Wendy., The Story of Brecknock, Gwasg Carreg Gwalch, Llanrwst, Gwynedd, Wales, 1995. Categories: Ancient Settlements / Camps, Crannog / Island settlement, Myths And Legends | Tags: Llangorse Lake And Crannog in Powys Wales, Llangorse Lake Dug-Out Canoe | Permalink.